Applying to law school this year? Then check this out. Here is the deadline list for most ABA-approved law schools for entry in the fall of 2010. LSAC’s Law Forum Registration is now OPEN! A great place to learn more about almost every ABA-approved U.S. law school is an LSAC Law Forum. 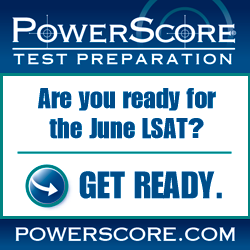 December 2009 LSAT scores are out TODAY! Have you checked your email yet? A week ahead of schedule, LSAC has started releasing scores for the Dec09 LSAT administration. Law School Admissions: Who is responsible for what? Watch and listen while we talk about who is responsible for what within the law school admissions process. Watch and listen while we talk about important points in regards to the law school admissions addenda. Watch and listen while we talk about important points in regards to the law school admissions supplemental essays. Watch and listen while we talk about important points in regards to the law school admissions personal statement.